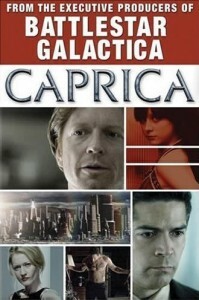 Caprica movie hits shelves today. (Press Release) – Caprica, the highly anticipated prequel to Battlestar Galactica, will enjoy its world premiere exclusively on DVD on April 21, 2009 from Universal Studios Home Entertainment. In a groundbreaking move sure to delight fans of the long-running television phenomenon, the feature-length prequel will be available on DVD as a limited-edition uncut and unrated version before the series’ broadcast premiere on the SCI FI Channel in 2010. Caprica is executive produced by Ronald D. Moore and David Eick (Battlestar Galactica) and Remi Aubuchon (24). Exclusive bonus features that take viewers behind the scenes of the creation of Caprica make this DVD a landmark event for any fan of Battlestar Galactica. The film will also be available at selected online destinations for digital download transactions. As Battlestar Galactica wraps its gripping final season on SCI FI on March 20, 2009, Caprica begins a brand new epic saga that continues the franchise’s commitment to thought-provoking storytelling and extraordinary characters. Set over 50 years before the events of Battlestar Galactica, Caprica is a world at the peak of its power, grappling with new science and technologies and the issues they create. The series will star Golden Globe nominee Eric Stoltz (Mask, Pulp Fiction), Esai Morales (Jericho, NYPD Blue), Paula Malcomson (Deadwood, ER) and Golden Globe® nominee Polly Walker (Cane, Rome) in a story laced with passion, intrigue and family conflict. 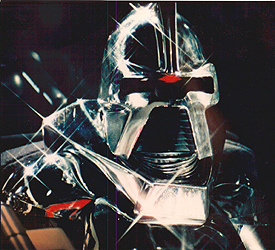 New Battlestar Galactica movie based on 1st gen series! (IGN.com) – IGN Movies has learned that Universal Pictures is planning to turn the TV series Battlestar Galactica into a feature film with series creator Glen A. Larson being lined up to script and produce it. 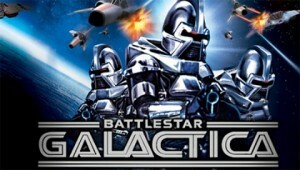 Ign.com was informed that the film will be based on the original BSG series from 1978-79 rather than the recent reboot from Sci Fi Channel. The story followed a band of humans who were the only survivors of a devastating attack on their colonial homeworld by the vicious cybernetic race known as the Cylons. The survivors, led by Commander Adama, embark on a journey through space aboard the military vessel Battlestar Galactica to find refuge on a distant planet called Earth.